Regis Philbin was on the David Letterman Show 136 times. Pete Neild has 133 more to tie the record. Yesterday I enjoyed having Poway City Council Candidate for District 1, Pete Neild, join me for the third time on the John Riley Project. Pete Neild is a scientist and he has been very diligent gathering data from citizens in District 1 surveying them on key issues in this race. He has reached 1200 people in District 1 just by driving his beautiful Corvette, Calypso, around town and chatting up people on the street walking their dogs and working in their yard or garage. This is remarkable particularly since he is not knocking on doors. This personal connection with voters has resulted in him getting votes simply because he was the only candidate to talk to that voter. Pete came prepared with a treasure trove of data that he gathered from voters along with accompanying charts and graphics. His analysis included survey data about the Poway Road plan and how voters wanted “slow growth” and “small growth”. We also discussed the data he collected from voters about the future of the Poway Senior Center/Community Center. One of the key features of Pete’s campaign and which separates him from his competitors is his enthusiastic support of the district voting plan for Poway. Pete is a big supporter of council representatives connecting with their constituents, listening and then representing their interests to the council. 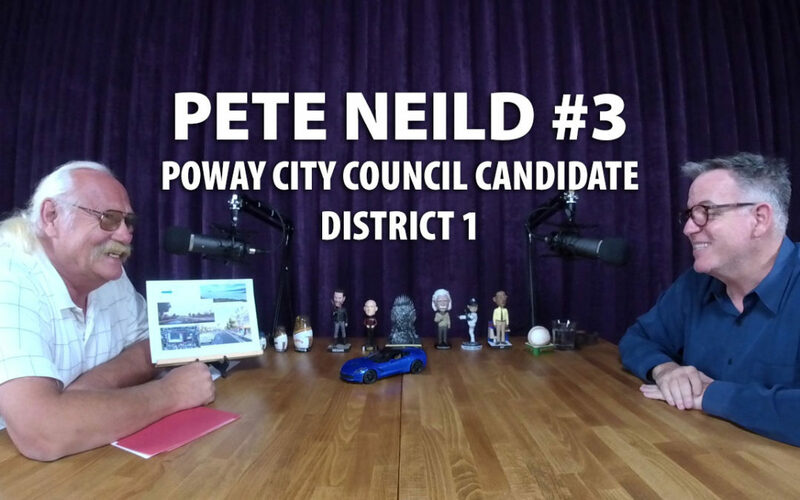 Pete has a great innovative idea to create his own “Pete Neild Council” consisting of representatives of individual neighborhoods that he would meet with regularly so he can listen to the people’s needs and better represent his district. Pete broke down the demographics of the different Poway voting districts. We zeroed in on individual neighborhoods and his Google Time Line driving routes through the “Land of a 1000 Cul-de-Sacs”. We also broke down the campaign finances of Pete’s competitors and then all candidates running for Mayor or City Council. His competitors have raised approx $3000 from donors. Pete, however, believes that money is a corrupting influence in politics and has vowed to refuse all donations and only spend $200 or less on his campaign. By remaining under the $200 spending limit, he is not required to file campaign finance paperwork with the Registrar of Voters. I enjoyed discussing political parties with him. In a non-partisan race we hope political parties would not be an issue, but in reality they are. Pete considers himself to be a Jeffersonian Republican which means he is “middle of the road”. However, he did register as a Democrat specifically to take a humorous dig at his father. He was able to parlay that into an endorsement from the San Diego County Democratic Party. But the reality is his political sensibilities are not traditional Democrat or traditional Republican at all. We gained agreement on the importance of constitutional limits of government authority and protection of our inalienable rights of life, liberty and the pursuit of happiness. We touched on numerous other issues including Pete Babich, his first visit to Poway in 1970, population growth in Poway, the revolutionary founding fathers of Poway, WalMart, the importance of developers speaking to neighbors to get their input on new housing projects, Donald Trump and the 14th amendment, birthright citizenship, Pete’s Calypso experience from dreaming to ordering to buying and now to owning (future podcast! ), Lucy, submarine special operations, going under the ice, sonar and asking his colleagues and superiors for their political endorsement.